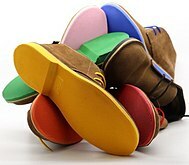 Veldskoen (or vellie, colloquial, veldskoene plural, alternately velskoens or velskoene plural; pronounced "FELL-skoons") are Southern African walking shoes made from vegetable-tanned leather or soft rawhide uppers attached to a leather footbed and rubber sole without tacks or nails. The name comes from Afrikaans vel ("skin") (later assimilated to veld ("field")) and skoen ("shoe"). They were first made by the Dutch East India Co. in the 17th century by the first Dutch settlers in South Africa. Their design is believed to be based on the traditional Khoisan footwear observed by these settlers. The footwear was later embedded into the Afrikaans psyche when the velskoen was used as the footwear of the Great Trek. Easy to make, lightweight and extremely tough, the vellie could withstand the harsh conditions of the great migration north. The vellie has become part of South African, Zimbabwean (previously Rhodesian) and Namibian society, worn by all classes and professions but favoured by farmers and safari guides. Nathan Clark's company, C&J Clark, made the desert boot famous but Clark's design is modeled after the same round toe and style last used to manufacture velskoen. Clark was inspired by the shape and design of the velskoen he discovered for sale in the bazars of Cairo, which were imported to Egypt from South Africa. They are sometimes considered light boots, and can essentially be considered a subset of chukka boots or desert boots although vellies tend to have a lower topline. Veldskoen soles are sometimes cut from old car tyres rather than crepe rubber. Veldskoene saw considerable use by the Rhodesian Army during the Rhodesian Bush War as tough light-weight boot. Vellies along with canvas "Takkies" were also favourites of the Selous Scouts as the creped sole made going untracked easier than the heavy lugs normally found on infantry boots. ^ Shoes, Veldskoen Shoes (20 July 2016). "Veldskoen Shoes". Retrieved 11 January 2019. This shoe-related article is a stub. You can help Wikipedia by expanding it. This page was last edited on 14 January 2019, at 15:15 (UTC).